The first matter transporter making it possible to cross stellar distances brought humans into contact with a species called the Chromoites. Via subspace radio, an exchange was proposed where a Chromoite would be teleported to Earth and a human sent to Chromo. The extraterrestrials tricked us, however. The Chromoite transmitted in the initial phase of the exchange was a homicidal prisoner who the aliens had badly wanted to ship off-planet. The unsuspecting Earth scientists gave the rogue Chromoite the run of their laboratory but he was not allowed outside the research facility. The alien killer quickly realized that humans regarded his gelatinous, tentacled shape as hideous. Formulating plans to dominate and plunder his new home world, the interstellar exile knew his most urgent need was somehow to pass for human. Working at night in the lab, he duplicated some of the matter-transporting circuits and turned them on himself in an attempt to change his shape from pure horror into something more pleasantly anthropomorphic. 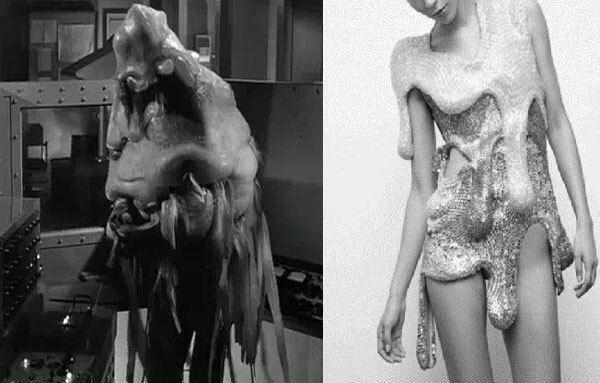 Part of the switch involved gender reassignment, as the alien had decided that masquerading as a human female might make him appear less threatening. Amazingly, he succeeded in morphing himself into an attractive Earth woman, but with one problem: parts of his torso had a tendency to deliquesce into something like his original form. He rummaged through the lab and found a bulky jumpsuit that would hide this deformity and escaped that same night. He eventually made his way to New York City and hired a designer to fabricate clothing that would keep his "secret" safely covered up -- explained to the designer as a rare form of Elephantiasis. A suite of shapeless (but stylish) caftans or muu-muus were created that swathed most of his body. Gradually, through a combination of brains, beauty, and sociopathic wiles, the alien became prominent in New York society as a hostess of large and lavish parties. He began to gain the confidence of powerful movers and shakers, and to subtly influence public policy to benefit his nefarious plans. After several years he had become so confident in his shadowy, behind-the-scenes power that he mingled at one of his soirees with his true form exposed. With his fashion designer co-conspirator standing proudly at his side, he revealed to the assembled grandees his "new biomorphic dress." It was a hit, and he even allowed himself to be photographed for a glossy magazine, with part of his face contractually cropped out of the image. An earlier appearance of the Chromoite. The app moved the purple-jacketed photographer from the model's right to her left and merged him with a random individual in the shot. The quantum probability smearing of the model's arm across the image indexically reflects a mouse gesture of the less privileged and valorized photo-manipulator. The app's druggy continuum destabilizes a system of exploitation and starvation for profit, without ultimately breaking down its function as a seduction-engine. Or other recuperative words to that effect. 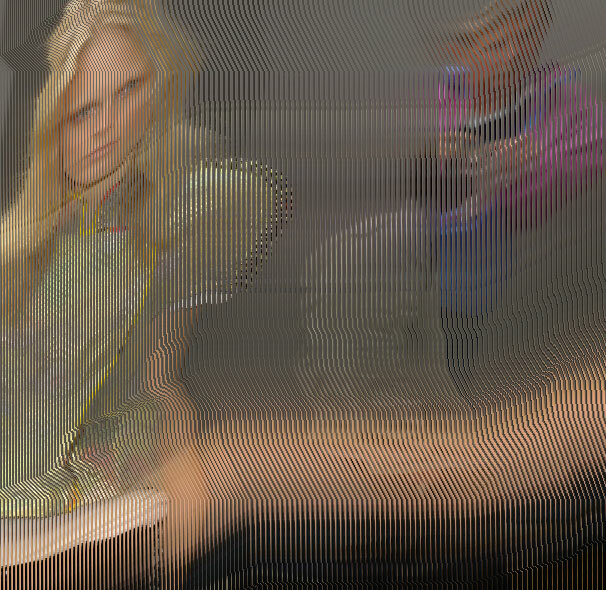 The distortions in the model's left shoulder are a feature of the clothing-design rather than a bug induced by the app.